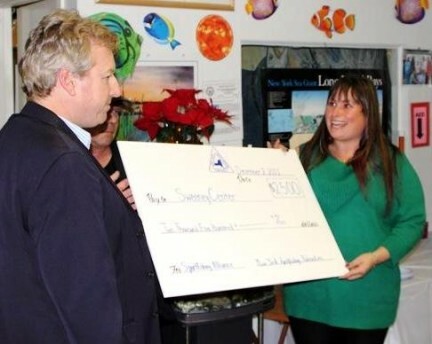 On December 2, 2011, the New York Sportfishing Federation presented a check for $2,500 to the Bob Sweeney Sportfishing Education and Aquaculture Center. Opened on Long Island in 2002 at Cedar Beach Marina just off the Ocean Parkway in Babylon, the facility was constructed through the efforts of Assemblyman Bob Sweeney (of Lindenhurst) and the New York Fishing Tackle Trade Association (NYFTTA). The mission of the Center is to provide an arena to promote saltwater recreational fishing and teach angling ethics. New York Sportfishing Federation director Jim Hutchinson (with vp Chuck Hollins in the back) present a $2,500 check to Tracy Marcus and the Sportfishing Education Center. The Center’s educational tools include a fishing museum, library, rod & reel loaner program, and an aquaculture demonstration laboratory. Cornell Cooperative Extension Marine Program helped to create a marine education curriculum for school groups that visit the Center which covers many of the standards established by the New York State Department of Education. The Sportfishing Education Center educates residents in coastal communities, especially children, about the marine resources and ecosystems in local waters. “Sportfishing helps foster a much a deeper understanding about the marine and the coastal district as a whole, and the non-profit Sportfishing Education Center’s ongoing efforts to introduce more of our local youth to the wonders of recreational fishing is an investment in future sustainability,” said Jim Hutchinson, president of the New York Sportfishing Federation who adds that the Sweeney Center is also the location of many Long Island club meetings and gatherings, including the monthly meeting location for the New York Sportfishing Federation. True to its mission, the New York Sportfishing Federation continues to provide support, both financial and otherwise, for protecting and promoting the interests of the marine recreational fisherman, while helping develop programs which are designed to both protect and conserve the marine environment and fisheries in the area of the eastern seaboard. In 1996, the New York Sportfishing Federation launched our Teach A Kid To Fish program (TAKTF) for the purpose of involving and educating youngsters (7-15 years of age) about recreational fishing. The TAKTF program produces a deep and enduring awareness of the importance of stewardship of marine waters, while helping provide a hands-on introduction to marine conservation issues such as protecting the marine resources from over-exploitation, using proper catch and release methods, species identification, sea safety and the observation of New York State DEC regulations. Every summer now for the past several seasons, New York Sportfishing Federation volunteers have helped sponsor party boat fishing excursions for local youth groups. In 2012, our goal is to sponsor three different Teach A Kid To Fish trips, from the north shore at Port Jefferson, the south shore at Captree, and the west end in Brooklyn. Check back on this page periodically as we post photos from these and past trips along New York water in which local children and adults both learned a valuable lesson first-hand – Tell Me and I May Soon Forget; Involve Me and I Will Always Remember!